By understanding how to use file manager application, I hope you can organize files that stored on your Android phone or tablet better. File manager application is already installed from beginning on some of Android phone or tablet. However, this app is unavailable on some type of Android devices. But don’t worry; if your Android phone doesn’t have it, you can install file manager application from Android Market. The choices are very much with their own advantage and disadvantage. Below is a screenshot of file manager application called “Dual File Manager XT”. To navigate when using a file manage application, you can simply click the folder to enter it, and press the BACK button to return to the previous folder. A few days ago, someone asked me how to create folder in Android, for example, how to make folder in Gallery application. This may be done by using the File Manager application. To make folders, the procedure might be slightly different depending on the used application. However, in many case, what the user have to do is open the file manage > click MENU button > click Create / New folder > give a name > Click OK or Done. Determine where you want to create the folder. Whether in the root directory of the SD card or inside another folder. Note: root directory or root folder is the top-most directory in a hierarchy or in other words, it’s not inside any folder. Here are the steps to copy, paste and move files on Android. 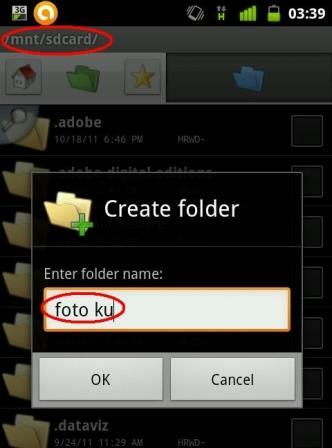 For example, I will move some photos taken using my Android phone camera into the “Foto Ku” Folder that I previously made. I will use Dual File Manager XT to do the job. Click the Camera folder (the position indicator will becomes mnt/sdcard/DCIM/Camera). Step II (alternate): If you want to copy or move a single files only, you can click and hold on the desired file > it will show you a pop up menu > click Copy / Move. After the process is complete, the photos that I already move from Camera folder will appear in the “Foto Ku” folder every time I open the Galley application. Note: Dual File Manager XT advantage is this app can open two different directories (folders) simultaneously. For example when you open the mnt/sdcard/DCIM/Camera folder, to return to the mnt/sdcard folder, you do not need to press the BACK button twice, but you can click the TAB at the right of the screen. 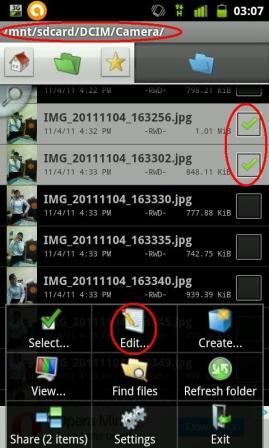 To delete or rename file on Android phone / tablet, you can use the file manager application. What you have to do is open the file manager > click and hold on the file you want to delete or rename > Click “rename” to change its name and click “delete” to erase it. If there is no pop up menu after you insert the CD, then you should open “My Computer” > Click on the CD Drive > Click install.exe / start.exe / autorun. If there is no Driver CD in the sales package, try to plug the Android phone / tablet to the computer via USB cable data. In some types of Android devices, the driver is stored in the phone or tablets itself. So when you connect your Android phone into the computer, it will give you an option to install Android drivers. After the SD card can be read on the computer, you can transfer file from pc to android or vice versa. To do that, you just have to open “My Computer”, open the SD card driver, and then copy paste or move and paste file as usual. If the computer is able to detect your phone, but you can not access the SD card file, try to open the notification panel on your Android phone or tablet > click on “USB Connected” / “USB Connection” > click “Turn on USB Storage” / ”USB Mass Storage “. ATTENTION! 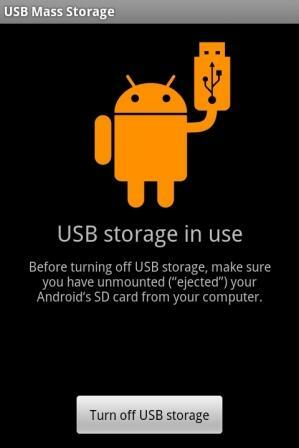 : to prevent damage on the SD card and to prevent file corruption, always Safely Remove the Android device and Turn Off USB Storage before you unplug the USB Cable Data from the computer. 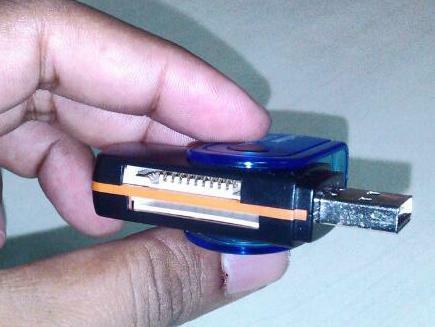 SD card reader that sold nowadays usually can read various sizes and types of SD Cards. The SD card that used in Android cell phones and tablets nowadays is mostly a Micro SD type. 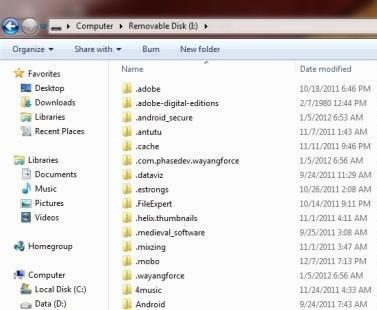 Remove the SD card from your Android phone or tablet. Here’s how: Go to Settings > click the “SD Card & Phone Storage” > Click Unmounting SD Card / Remove the SD card > click OK> Wait until it shows “Safe to Remove the SD Card” at the notification panel > Remove SD card. Note: You can also remove the SD card by turning off your first Android device. Plug the SD Card into the Card Reader > Pay attention on the position of the SD Card mounting. After you done transferring file between computer and your Android SD card, unplug the reader. Remember to always Safely Remove Hardware first (See Figure 5).